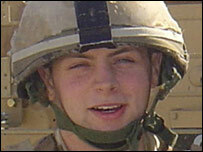 A British soldier killed in an attack in southern Iraq has been named by the Ministry of Defence as Daniel Lee Coffey, who was 21. Rifleman Coffey, who had been serving with the 2nd Battalion The Rifles, was injured while on patrol in Basra on Tuesday morning. He later died from his injuries and is the first soldier of the Rifles to be killed in action. His commanding officer said he occupied a unique place in the regiment's story. The MoD said the soldier had been returning to his base at the Shatt-Al-Arab Hotel after taking part in a task mentoring the Iraqi Police Service when his patrol was ambushed by two gunmen. Rifleman Coffey was single and had family in Devon and Newcastle. His company commander Major Michael Foster-Brown paid tribute. "Rifleman Coffey had the qualities of a good rifleman: hard-working, thorough, quick-witted, brave, adventurous and with maybe just a hint of cheekiness. "With these qualities he had strong potential for the future. We will miss him and we feel for his family." UK troops levels are set to be reduced this year. The number of personnel killed in operations now stands at 133. Combat has claimed the lives of 102. Last week the government said troop numbers would be cut from 7,100 to 5,500, the first large-scale withdrawal from Iraq.